US, 1939, 91 minutes, Black and white. Mickey Rooney, Walter Connolly, William Frawley, Rex Ingram, Elizabeth Risdon, Minor Watson. The Adventures of Huckleberry Finn is a pleasant if unremarkable version of Mark Twain’s story. There have been many other versions, including a 70s musical with Jeff East as well as a version with Elijah Wood. This film was tailored to the popularity of Mickey Rooney at the time. He had already made four Andy Hardy films – and his Huckleberry Finn is obviously a cousin of Andy Hardy. The film focuses on Huck, his wagging school, his being looked after by Miss Watson, the friendship and support of the Widow Douglass. Jim, classic actor Rex Ingram, is the slave of the household who wants to get back to the free territory to see his wife and son. Victor Kilian is Huckleberry Finn’s tyrannical father who wants to sell him. Huckleberry decides to run away, he encounters his father again, encounters Jim who has been accused of murdering him. 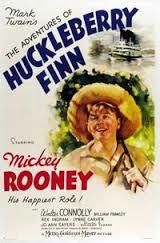 Huckleberry disguises himself as a young girl to find out what is going on, but has to flee on the river. When they encounter the steamboat, they pick up Walter Connolly and William Frawley as two conmen. They pass themselves off as dukes and kings of Europe. They also have a plan to go to a town and assume the roles of long-lost brothers and inherit a fortune. They take Huckleberry along with them. In the meantime, the captain of the steamboat is aware of the plot, is helped by Huckleberry with the promise that he will take Jim to freedom. While the conmen are tarred and feathered, Jim is sent back to stand trial, is the victim of a lynch mob, is finally freed with Huckleberry turning up after he has been bitten by a rattlesnake and taken to the doctor by Jim. There is a happy ending for Jim – but Huckleberry has to wear shoes, go to school and stop smoking. The particularly significant theme is the racial one, Huckleberry firmly against the abolitionists, presuming that slavery is correct, having a conscience that he should send Jim back to his owners. However, in company with Jim, meeting Captain Brandy, he learns what the abolitionists are about – and the fact that slavery is abhorrent – with a mention of Abraham Lincoln. 1. The popularity of Mark Twain’s novel? The archetypal American novel? Of the South? Of the spirit of freedom? The critique of the South, especially its adherence to slavery? 2. The black and white photography, Mickey Rooney as star? The comic support? The musical score? 3. Huckleberry Finn in the American imagination? Worldwide? As Mickey Rooney? His age, wagging school, fishing in the river, not wearing shoes, smoking the pipe? Not being promoted? His being looked after by Miss Watson and the Widow Douglass? The meals, Jim waiting table? The reading of the Scriptures? His friendship with Jim? 4. His father’s arrival, tyrannical, accusing his son of airs and graces? The encounter with the two ladies? His being willing to sell his son? 5. Huckleberry, the discussions with the Widow Douglass, her kindness, the gift? His leaving it behind as he ran away, his note? The decision to run away, the encounter with Jim? Their sailing on the river together? 6. His going back to the town, disguised as the girl, his being found out? Seeing the lynch mob? The escape? The houseboat, his dead father? Jim’s not telling him – and Huckleberry taking this badly later? 7. Jim, his character, his wife and son, in the free territory? His desire to pay for his freedom? His decision to run away? Miss Watson having to sell Jim to raise the money to buy Huckleberry from his father? 8. Adventures on the river, the two talking? The throwing overboard of the king and the duke? Their being picked up? The fabricating of the dukedom and royalty? Their wanting to be waited on? 9. The comic touches with the king and the duke? Cards? Their going to the town, posing as the brothers? Their being accepted? The two nieces? The will, the strongbox, the money – and the plan to give the money to the women but sell the house? Promising to take them to England? Huckleberry and his objections, his posing as their servant, hiding in the room and hearing the plan? His taking the money? 10. Captain Brandy, the administrator of the will, his suspicions of the conmen? Huckleberry going to him? The money? The issue of Jim? Huckleberry and his being bitten by the rattlesnake, Jim carrying him to health? 11. The news of Jim’s being taken back, the law, the accusation of murder? The trial, the sympathy with the judge, the Widow Douglass and her proposal to go to Pikesville? The prosecutor, the posse? Their attacking the prison, Jim’s fear? 12. Captain Brandy, taking Huckleberry to home? His arriving in time – and the happy ending? Jim and his freedom? Huckleberry staying with the two women – at school, with shoes, not smoking?